A regular breeding resident and migrant; tends to migrate early in the fall (late August–early October), but on rare occasions a few birds linger into the early winter before migrating south. The Blue-winged Teal was a common species during the Minnesota Breeding Bird Atlas (MNBBA). The Blue-winged Teal is broadly distributed across Alaska, Canada, and the northern United States; in the west the species occurs as far south as New Mexico and Texas. The Blue-winged Teal reaches its highest breeding densities in the Prairie Pothole Region of the north-central United States and the southern Canadian Prairie Provinces (Figure 1). A game species, the Blue-winged Teal is designated a Moderate Priority by the North American Waterfowl Management Plan. It has been assigned a Continental Concern Score of 7/20 by Partners in Flight. A long-distance migrant, wintering from the southern United States south to northern South America. A dabbler that feeds on aquatic invertebrates and plants; rarely feeds away from water except during fall migration. Breeding distribution and relative abundance of the Blue-winged Teal in North America based on the federal Breeding Bird Survey from 2011 to 2015 (Sauer et al. 2017). While the Blue-winged Teal is far less abundant than it was fifty years ago, it is today the commonest of the summer resident Ducks, having endured the destructive changes attendant upon the settling of the state better than any other species. Almost every suitable slough and marshy lake throughout the state has one or more pairs of nesting birds. Indeed, when Walter Breckenridge surveyed western Minnesota in 1929, he found the species to be the most common waterfowl in the region (Roberts 1932). At the time, confirmed nesting records (nests with eggs) were available from Jackson County in the southwest corner of the state, Grant County in west-central Minnesota, Polk and Kittson Counties in the northwest, and Hennepin County in east-central Minnesota. Breeding evidence (young broods) was also available from Big Stone, Cook, and Lincoln Counties. Many years later, Green and Janssen (1975) described the Blue-winged Teal as a summer resident throughout the state and, once again, as the most abundant breeding duck in the state. When Janssen (1987) prepared an updated account of the species’ status just 12 years later, the Blue-winged Teal had moved to second place, outnumbered only by the Mallard, which continues to be the most common waterfowl species in the state to this day. Although breeding records were available from all regions of the state, Janssen noted that the species was least abundant in the northeastern counties. By 2014, fieldwork conducted by the Minnesota Biological Survey documented the species’ strong presence throughout the Prairie Parkland Province, with numerous records in all but the most intensively cultivated counties. Farther to the north and east, breeding season observations were more sparsely distributed (Minnesota Department of Natural Resources 2016). Since 1970, Hertzel and Janssen (1998) reported nesting had been confirmed in 69 of Minnesota’s 87 counties; 11 of the 18 counties where it had not been documented nesting were in the southern third of the state. During the MNBBA, participants reported 1,524 Blue-winged Teal records in 20.3% (967/4,768) of the surveyed atlas blocks and in 21.9% (511/2,337) of the priority blocks. Breeding was confirmed in 159 (3.3%) atlas blocks (Figures 2 and 3; Table 1). The species was observed in 86 of Minnesota’s 87 counties (absent in Pine County) and was confirmed breeding in 51 counties. It was most abundant in the Prairie Parkland Province, especially in west-central Minnesota, and in the northern half of the Eastern Broadleaf Forest Province; it was least abundant in the Laurentian Mixed Forest Province. The land suitability model for the Blue-winged Teal predicts that suitable habitat occurs throughout the Prairie Parklands, especially from the west-central counties of Lac qui Parle and Big Stone north to the Canadian border (Figure 4). The importance of the wetland complexes in eastern Marshall County also is highlighted. The Blue-winged Teal was the third-most-common duck species reported during the MNBBA, outnumbered by both the Mallard and the Wood Duck. Although its relative abundance has changed since Roberts’s first comprehensive account of the species in 1932, the core of its breeding distribution in the state has likely changed very little. In their comprehensive review of the Blue-winged Teal, Rohwer and his colleagues (2002) noted several historical changes in the species’ breeding distribution. Most significant may be the species’ increase in abundance along the East Coast, where the creation of waterfowl impoundments has improved habitat opportunities. Increases have also been noted in the western United States, where the species was formerly uncommon west of the Rocky Mountains. In contrast, in portions of the Upper Midwest where wetland losses have been significant, such as Iowa and Illinois, the species is likely less common than it was prior to extensive European settlement (Rohwer et al. 2002). Among neighboring states and provinces that have conducted two atlases, both Michigan and Ontario documented significant declines, either in the number of townships reporting the Blue-winged Teal (Michigan) (Chartier et al. 2013) or in the overall probability of observation (Ontario) (Cadman et al. 2007). Both Iowa (Iowa Ornithologists’ Union 2017) and South Dakota (Drilling et al. 2016), however, reported increases during the second atlas. South Dakota attributed the small number of reports during its first atlas to drier conditions, which decreased the availability of suitable wetlands. Breeding distribution of the Blue-winged Teal in Minnesota based on the Breeding Bird Atlas (2009 – 2013). Summary statistics of observations by breeding status category for the Blue-winged Teal in Minnesota based on all blocks (each 5 km x 5 km) surveyed during the Breeding Bird Atlas (2009-2013). Summary statistics for the Blue-winged Teal observations by breeding status category for all blocks and priority blocks (each 5 km x 5 km) surveyed during the Minnesota Breeding Bird Atlas (2009-2013). Landcover suitability of the Blue-winged Teal in Minnesota based on habitat, landscape context, and climate data gathered during the Minnesota Breeding Bird Atlas (2009-2013) using the MaxEnt modeling approach. The Blue-winged Teal prefers temporary and seasonal wetlands that are teeming with aquatic invertebrates. As the breeding season progresses and many of the shallower wetlands dry up, the species often shifts to more permanent wetland basins (Swanson et al. 1974). Large permanent wetlands are especially important in drought years; hemi-marshes that provide a relatively equal proportion of emergent cover and open water are preferred (Figure 5). Pair densities are strongly correlated to the availability of aquatic invertebrates and to the number of flooded wetland basins in the local landscape (Rowher et al. 2002; Gammonley and Fredrickson 1995). Densities decline significantly when temporary and seasonal wetlands dry up. In drought years large numbers of birds may simply move to an entirely different region of their breeding range. Nesting occurs in upland grasslands or wet meadows. Agricultural fields may be used but are not preferred. Nests are located close to water, usually within 100–150 m, although they may be up to 1.6 km away (Baldassarre 2014). Residual cover from the previous growing season is important. Indeed, burning, mowing, or grazing late in the summer can reduce a site’s suitability for Blue-winged Teal nesting the following spring. At the landscape scale, the availability of grassland cover can be as important as the density of wetlands in determining habitat suitability. The Blue-winged Teal demonstrates little site fidelity from year to year, responding instead to the local and annual variability in wetland conditions. Typical breeding habitat of the Blue-winged Teal in Minnesota (© Lee A. Pfannmuller). Since 1955, waterfowl populations in North America have been monitored by the Waterfowl Breeding Population and Habitat Survey, a cooperative effort of the U.S. Fish and Wildlife Service, the Canadian Wildlife Service, and state, provincial, and tribal resource agencies. It focuses on two large areas: the Prairie Pothole Region of the United States and Canada (known as the Traditional Survey Area) and the eastern Canadian provinces and the state of Maine (known as the Eastern Survey Area). Although Minnesota is not included in either area, the survey conducted in the Traditional Survey Area is considered the benchmark regarding the status of all grassland nesting waterfowl species. In 2015 the Waterfowl Breeding Population and Habitat Survey estimated a continental breeding population of approximately 8.5 million Blue-winged Teal (Zimpfer et al. 2015). This is the highest population estimate since the survey began in 1955 and is significantly higher than the continental population goal of 4.7 million birds established in 2004 by the North American Waterfowl Management Plan (2004) (Figure 6). It also is 73% above the long-term average of 4.9 million birds (1955-2014). Blue-winged Teal numbers hit an all-time low of 2.8 million birds in 1990. This low number occurred at the peak of a widespread drought in the Great Plains that spanned the late-1980s and early-1990s. 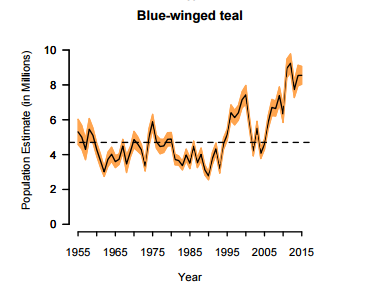 With a few exceptions, Blue-winged Teal numbers have been increasing since 1990. Higher precipitation levels, coupled with focused conservation efforts, have paid dividends in the Prairie Pothole Region. The establishment of the Conservation Reserve Program (CRP) has been especially important. Designed to temporarily protect highly erodible agricultural lands, the CRP provided significant new nesting cover for an entire suite of grassland-dependent species. Unfortunately, when commodity prices are high, fewer farmers are inclined to renew their 10-year contracts, leaving grassland conservation efforts vulnerable to fluctuations in economic markets (McDonald 2013). Currently, the Blue-winged Teal is the second-most-abundant duck species in North America, following the Mallard, which outnumbers the Blue-winged Teal by nearly 3 million birds (Zimpfer et al. 2015). In contrast to its overall status in the Prairie Pothole Region, the Blue-winged Teal population in Minnesota is not faring well. The degree of its decline depends on the source of data examined. 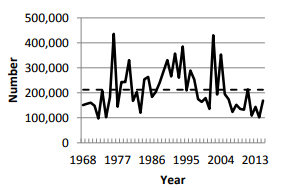 The Minnesota Waterfowl Breeding Population Survey (which is not statewide but is focused in the central and western regions) has been tracking population numbers since 1968 and documents widely fluctuating numbers, with a prominent decline in the past decade (Figure 7). 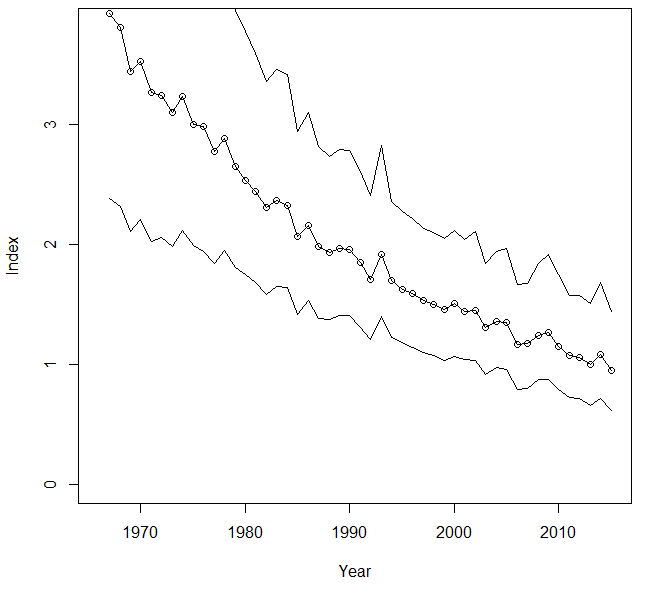 The federal Breeding Bird Survey, which is statewide in scope but not as intensive an effort as the Minnesota waterfowl survey, documents a significant long-term decline, averaging 2.91% per year since 1967; the rate of decline increased to 3.32% per year from 2005 to 2015, similar to the recent decline noted by the state waterfowl survey (Figure 8). The 2015 population estimate for the area surveyed by the state waterfowl survey was 168,615, which was a 66% increase above numbers reported in 2014 but still 21% below the long-term average of 212,356 birds (Cordts 2015). The loss of more than 90% of Minnesota’s wetlands and the weak protection currently afforded to many temporary and seasonal wetlands are considered principle factors in the species’ decline (Minnesota Department of Natural Resources 2006). Population estimates for the Blue-winged Teal in the Traditional Survey Area, 1955–2015 (Zimpfer et al. 2015; dashed line is the NAWMP population goal). Population estimates (adjusted for visibility bias) and long-term average (dashed line) for the Blue-winged Teal in Minnesota, 1968–2015 (Cordts 2015). Breeding population trend for the Blue-winged Teal in Minnesota for 1967–2015 based on the federal Breeding Bird Survey (Sauer et al. 2017). Since the North American Waterfowl Management Plan was launched in 1986, numerous international, federal, and state programs have focused on habitat protection and on restoration efforts for critical breeding habitats. The plan’s goals are implemented largely through the actions of 18 joint ventures, which focus on leveraging resources to restore critical breeding habitats at the regional level. The Blue-winged Teal is a focal species in both joint venture regions that cover Minnesota: the Prairie Pothole Joint Venture and the Upper Mississippi River & Great Lakes Region Joint Venture. In addition, the North American Waterfowl Management Plan (2004) ranks the species as “moderately high” in importance across the continent. Due to its large and widely distributed population, however, Partners in Flight (2017) has assigned it a moderately low Continental Concern Score of 7/20. A game species throughout its range, the Blue-winged Teal is one of the most common ducks harvested in the United States, often ranking third or fourth overall. On average, more than one million birds are harvested each year. A little over 50% of the total harvest occurs in the Mississippi Flyway; nearly 8% of that harvest (76,562 birds) was in Minnesota in 2015 (Raftovich et al. 2016). That same year, Blue-winged Teal comprised 13% of the state’s total duck harvest. As a long-distance migrant, the Blue-winged Teal’s early fall departure in Minnesota significantly reduces hunting opportunities despite the species’ overall abundance. The same is true throughout North America; indeed, a special September teal season is designed to offer some harvest opportunities before the teal head south to their wintering grounds in Central and South America. Currently, Minnesota does not participate in this early hunt, although other states in the northern Mississippi Flyway (Iowa, Wisconsin, and Michigan) offered their first experimental September hunt in 2014 (Luukkonen et al. 2015). The Blue-winged Teal has benefitted from many aggressive conservation initiatives in the Prairie Pothole Region, including the Conservation Reserve Program. Nevertheless, the species’ numbers in Minnesota continue to decline. In 2006 the Minnesota Department of Natural Resources initiated its Long Range Duck Recovery Program to reverse the decline of all Minnesota waterfowl populations. The ambitious goal was to restore and protect an additional two million acres of habitat to restore a productive breeding population of one million birds by 2056. This represents more than a 100% increase above the population estimate of all ducks in Minnesota in 2014 (489,000). In addition to the Long Range Duck Recovery Program, an aggressive Prairie Conservation Program was recently launched (Minnesota Prairie Plan Working Group 2011), which establishes goals for grassland and wetland protection. The Blue-winged Teal’s future in Minnesota depends on the success of these statewide initiatives and the support of duck hunters and conservationists who support wetland conservation through important conservation organizations such as Ducks Unlimited. Swanson, George A., Gary L. Krapu, James C. Bartonek, Jerome R. Serie, and Douglas H. Johnson. 1974. “Advantages in Mathematically Weighting Waterfowl Food Habits Data.” Journal of Wildlife Management 38: 302–307.